Louisville Kentucky - the third best place in the United States to retire! retire, Louisville Kentucky ranks number Three! Coming in just behind Portland Oregon and Albuquerque New Mexico the new 2012 Money magazine report points to Louisville's love of horseracing, bluegrass music, Downtown District, waterfront Park, Broadwayshows and the Kentucky Center for the performing arts. 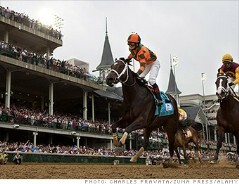 Money Magazine's Sarah Max writes "The first Saturday in May, all eyes are on Louisville, home to the Kentucky Derby. Yet there's also plenty else to do and see year-round". visit, move to or retire and why a piece of Louisville real estate. https://www.weselllouisville.com or call (502) 376-5483.